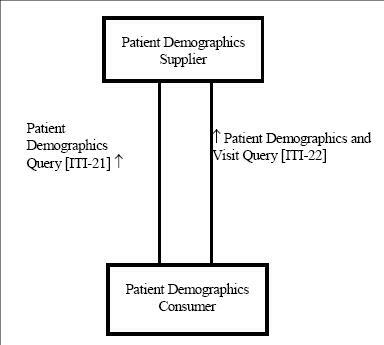 The Patient Demographics Query (PDQ) Integration Profile lets applications query a central patient information server and retrieve a patient’s demographic and visit information. Partial ID entry or scan. allows a Patient Demographics Supplier actor to receive a Patient Demographics Query or Patient Demographics and Visit Query request from the Patient Demographics Consumer actor, and returns demographics (and, where appropriate, visit) information. When the Patient Demographics Supplier Actor is grouped with actors in other IHE profiles that perform patient information reconciliation activities (e.g., Radiology PIR), the PDQ Supplier Actor may use the updated information to respond to PDQ Queries. In addition, the Patient Demographics Query Profile may play an integral workflow role in conjunction with other IHE Profiles. Enterprise-wide information systems that require patient demographics information. This page was last modified on 2 July 2018, at 15:36.